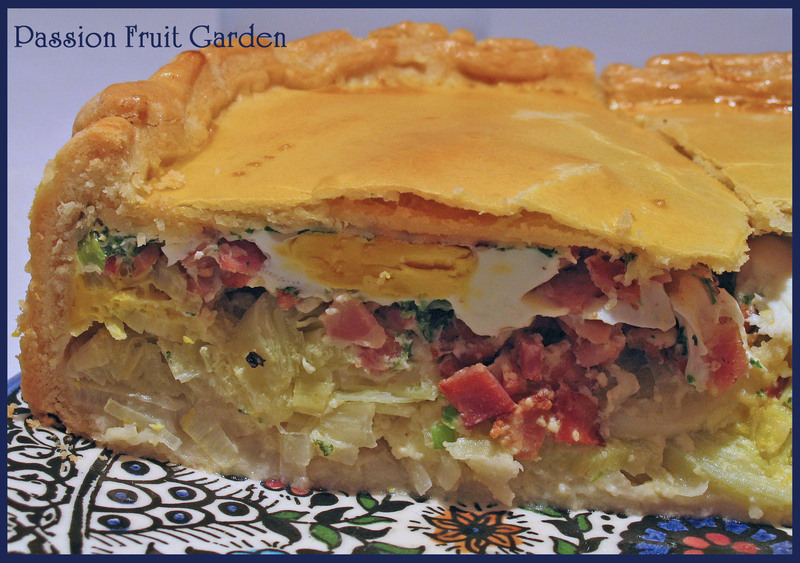 I have never met a person who didn’t like egg and bacon pie. It is just the best, perfect for a winter lunch with friends and this one is particularly scrumptuous. It is a nice, big, luscious pie with lots of filling. This recipe is based on Belinda Jeffery’s recipe from her wonderful book, Mix & Bake. I don’t use Belinda’s pastry but the filling is all hers. Place the flour in a food processor and pulse a few times. While the processor is still running, drizzle in cold water, very slowly. Stop when the dough begins to clump together. Do not let it form a ball. Wrap in Glad Wrap and refrigerate for, at least, 30 minutes. Microwave or steam the leeks until they are just tender, drain well and set aside. Fry the bacon until golden, set aside. Take the pastry out of the fridge. If it is a little stiff, wait until it softens. Divide the pastry into 2 balls: one ⅔ of the pastry and the other ⅓. Take the larger ball and roll it out so that it is large enough to cover a 24-26 cm springform tin. Line the tin with the rolled pastry, gently easing it into the corners of the base. Leave a bit of overhang and trim off the rest. Roll out the other ball large enough to fit the top of the pie, set aside in a cool spot. Spread the leeks evenly over the pie base. Scatter most of the bacon over the leeks. Sprinkle half of the parsley and chives over the top. Crack 10 eggs and gently place each one over the leeks and bacon. Try not to break the yolks. Scatter over the rest of the bacon and the herbs. Whisk together the remaining egg and the cream and then gently pour into the filling. Sprinkle a little nutmeg and coarsely ground black pepper over the top. Dampen the edges of the pie with water and then drape the rolled pastry over the pie. Press the pastry lid and base together. Trim pastry about 2 cm from edge and then roll the edges together to form a border. Decorate the pie with any scrap bits of pastry. Pierce the top a few times with a fork to allow the steam to escape. Try to avoid the egg yolks. Brush the top with the egg yolk and water glaze. Serve warm with a nice green salad. 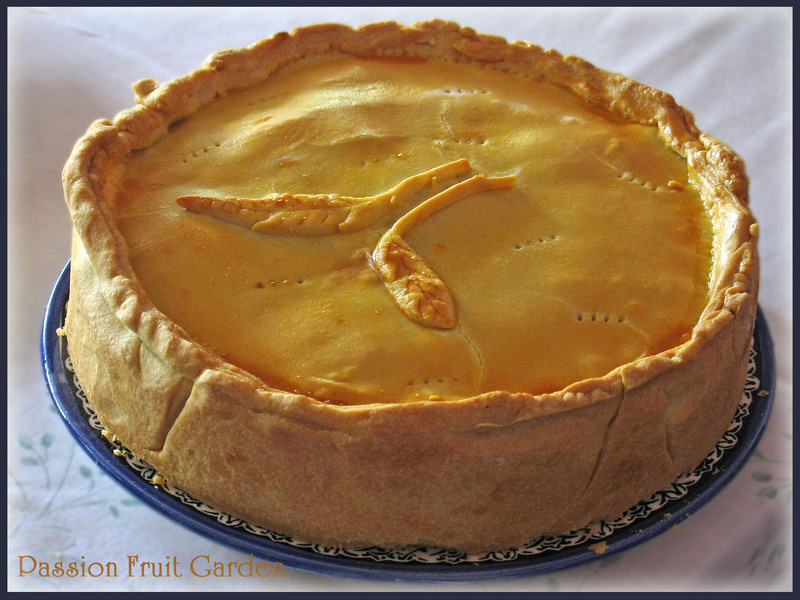 This entry was posted in Eating your bounty, Leeks, Pies and tarts, What's for dinner? and tagged Eggs and bacon, Food processor pastry, Leeks, Savoury pastry, Simple pastry by Glenda. Bookmark the permalink. 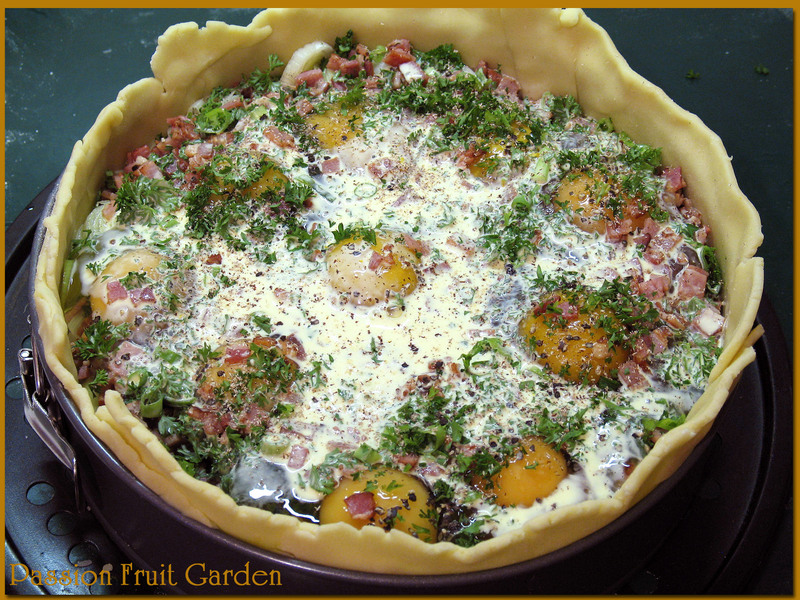 I’ve had this pie twice and mark my words it is fantastic, I love the way the eggs are still formed in the pie gives a great presentation. What size tin do you use Glenda as the pie is quite high?? Given that that creation is so gorgeous, and knowing your nature, how did you ever cut into it? Ha! Hey, I don’t even own chickens and I’d make it. Hi Doc, I couldn’t keep it in a bottle and, anyway, I had some hungry friends to feed. Hi Celia, it’s a pie for those like you who are lucky enough to have chickens. That looks wonderful, can I have a slice for brekkie please?